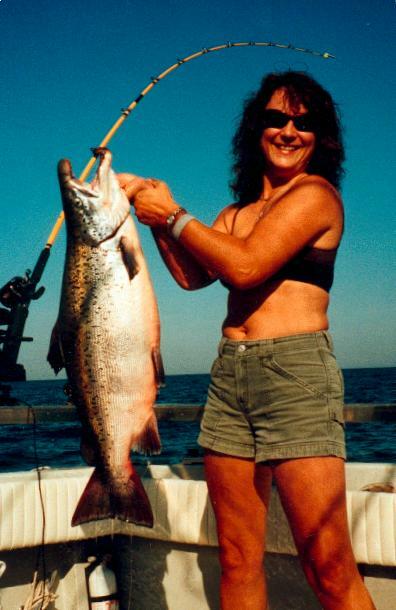 So, you’ve heard about the unbelievable fishing in LakeOntario for king salmon up to well over 30 lbs., plus brown trout, steelhead, and lake trout all reaching weights of over 20 lbs. You’ve decided you’re going to book a charter on this 200 mile long by 50 mile wide inland ocean in 2015. Whoa!!! Stop right there. Don’t make one more move until you’ve considered two things…, when, and where. Both are extremely critical to the success of your charter fishing trip. There are lots of uncontrollable variables like weather and the mood of trout and salmon on any given day that will affect your success or failure. But, when and where you fish are factors you can control. Wise decisions about each are the difference between time and money wasted or memories of an awesome fishing trip that will last forever. Lake Ontario is about 200 miles long, it’s southern shoreline winding 326 miles along the northern edge of New York State. Fishing along the coastline varies, with some areas producing better fishing for certain trout and salmon species at different times of the season. To keep things simple, let’s break the lake fishing season, which generally runs from April 1 to Sept. 30 into four categories, early spring(April/May), spring transition(June), midsummer(July and August), and early autumn(September). Now let’ take a look at the hottest fishing areas along New York’s coastline during these periods. Early Spring – Looking for early season cohos? 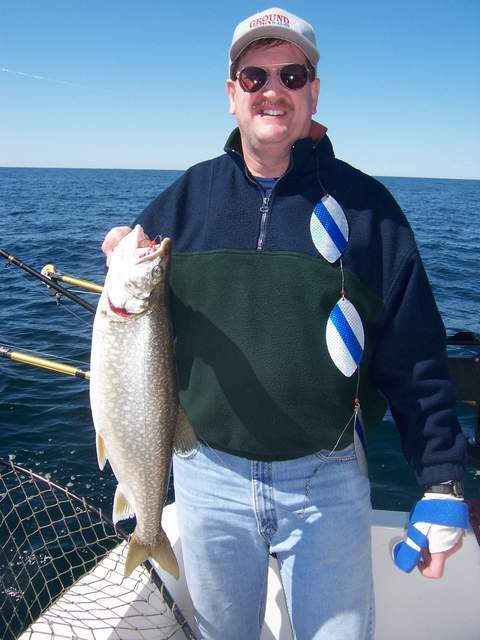 Fish the any of the ports from Oswego to the Niagara River with the west lake being best. 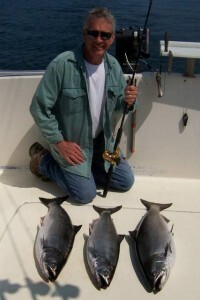 In May and June the best coho fishing is in the west lake. 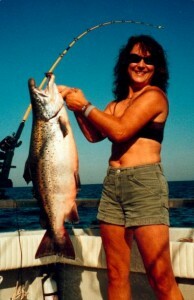 If you’re looking for spring king salmon, wait until at the first of May and fish either out of Oswego or one of the ports on the western end of Lake Ontario off the Niagara River out of the ports of Wilson and Olcott where salmon concentrate in and around the plume of the massive Niagara River. Because of heavy spring flows of sun warmed water from the Oswego River, the port of Oswego usually produces king salmon fishing in May, and my customers have put as many as 201 May kings in the cooler in 31 trips there, but spring salmon fishing out of Owego is not as consistent as in the western end of the lake. For spring brown trout, three of the very best LakeOntario ports are Oswego, Fair Haven, and Sodus, where charter captains target LakeOntario’s world class “football” browns. Point Breeze, Rochester, and Henderson Harbor and ports further west also produce spring browns. Spring Transition – By June, king salmon are scattered lakewide, but you’ll find most of the coho salmon action in the western end of the lake from Point Breeze to Wilson. King salmon fishing was hot and heavy just outside Oswego harbor in 2012 and again in 2014. Offshore steelhead fishing starts to heat up in June, as surface temperatures warm with some of the best fishing from Sodus west to Olcott. In the past three years, though, including late June, 2014, steelhead fishing was fantastic out of Oswego. June also produces some of the best fishing of the season for brown trout, especially big browns, out of ports in the eastern half of the lake. 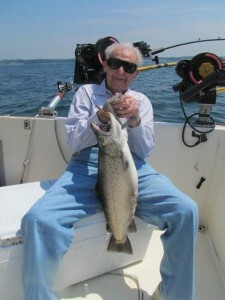 Midsummer – In July and August, every Lake Ontario port along New York’s 360 mile long coastline produces good salmon and trout fishing, but the focus in the west end of the lake is on salmon and steelhead, while east lake anglers are targeting salmon and brown trout. The big difference among ports by August…, tens of thousands of king and coho salmon beginning to stage in the southeast corner of the lake, as they prepare to spawn in the Salmon River, the Lake Ontario tributary with the heaviest salmon stocking and the greatest production of wild king salmon. 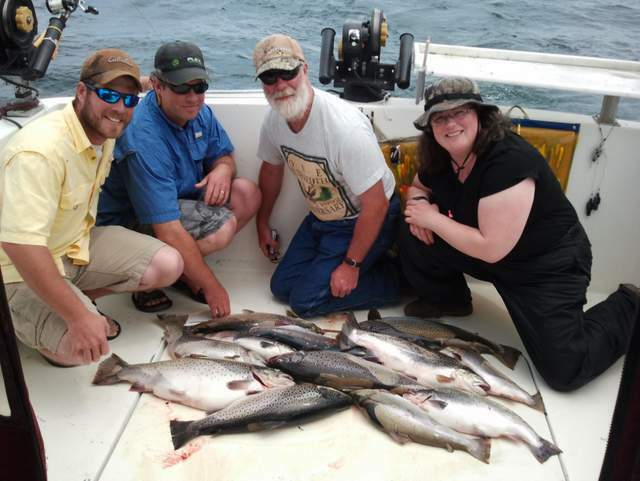 This is when anglers flock to ports like the Salmon River, Mexico Point, and Oswego Harbor. Lake trout are available lakewide, but it’s tough to beat the Henderson Harbor area in the northeastern corner of the lake, where a 38 lb. laker was boated in 2010. Early Autumn – In September, stocked and wild salmon are returning to their rearing streams, and all New York’s LakeOntario ports produce salmon fishing. Again, though, the largest concentration, by far, of king and coho salmon is in Mexico Bay in the southeast corner of the lake, making ports like Mexico Point and the Salmon River early autumn hotspots. As I backed the “Fish Doctor” into my slip at Oswego Marina, I noticed the New York State Dept. of Environmental Conservation’s creel census agent interviewing anglers. As we moored fast to the dock and the census agent approached us, my party of three anglers were anxious to show off their limit catch of nine brown trout from 4 to10 lbs. The agent couldn’t believe his eyes when they opened the cooler. They had checked several boats that morning before us, and had seen only 3 browns. Where? How? What? Those were the questions, as the census agents queried us while processing our fish and collecting data. As I mulled over the factors involved in catching those browns in the shallows east of Oswego Harbor on a calm, overcast day with the lake bottom clearly visible in 20 feet of water, I thought, “It’s not any one thing, it’s the system, a combination of equipment, location, a fine tuned presentation, and lure selection.” Before New York State’s daily brown trout creel limit dropped from 5 to 3 browns per person, this system produced 500 to 600 browns each spring aboard my charter boat, and continues to produce many limit catches of spring browns each season. Although I started developing my angling system for Ontario browns trout in, 1978, it wasn’t until zebra mussels and crystal clear water in the mid 1990’s that the real fine tuning began. That’s when the word, “finesse” became brown trout magic. A huge part of that finesse involves the use of ultralight tackle with light line and leaders. Ultralight Gear – On my charter boat, spring brown trout gear means custom built 9-foot noodle rods with ABU Garcia line counter reels pooled with10 lb. test hi-vis Berkley line for planer boards and 7’ custom rods with the same reels spooled with 10 lb. test Berkley Big Game for downriggers.. Eight foot long monofilament leaders in 6, 8, or 10 lb. test, are connected to the main line with a black, size #10 barrel swivel, with a small #1 Duolock crosslock snap on the terminal end.. Location – Two other simple parts of the equation…, think “INSHORE” and think “OSWEGO RIVER PLUME”, and constantly monitor the surface water temperature. In the spring, browns orient inshore, and the warm, turbid, plankton laden Oswego River water flowing into the frigid lake is a magnet to baitfish, brown trout, and other salmonids. Radio tagging studies and experience show that browns orient to the shoreline and the bottom, preferring water temperature from 47 to 65 degrees. When early spring temperature is less than 47 degrees, fish the warmest water, inside Oswego Harbor if the river isn’t too high and muddy or just outside the harbor in the warmer river plume. When the temperature is warmer than 47 degrees, you’ll find browns by locating baitfish, principally alewives. Presentation - Trolling speed and direction, plus stealth are essential. Spring browns usually prefer lures trolled at speeds ranging from 1.7 – 2.5 mph, slower in cold water and faster in warmer water. This also depends a lot on light and water conditions, the lure being trolled, and the mood of the fish on any particular day. Be aware of trolling speeds when you’re catching fish. If a rigger or planer board is firing consistently on the inside of a turn, browns may want a slower speed, and vica versa. I depend on a combination of electronics including a Fish Hawk Temptroll, GPS, and instinct to monitor trolling speeds. After every fish is taken, I enter the speed in my diary, and note the location either mentally or on my chart plotter. Straight-as-an-arrow trolling patterns at a constant speed are a trap for trollers. Variable, erratic speeds catch more fish, especially in calm seas. Trolling direction is important in the spring for Oswego browns because of Lake Ontario’s wind driven west to east shoreline current which averages about 1 mph. Troll a stickbait or flutter spoon into a current sweeping around a rubble point, and the effect is far different than trolling the same lures down current. Also, remember that lures trolled just below the surface in shallow, crystal clear water with a morning sun off your stern are more visible to fish than the same lures trolled toward the sun. Given a choice, I’ll always troll upcurrent along the shoreline with the sun to my back. Over the past 34 years I have fished out of most New York ports from Wilson, just east of the Niagara River near the west end of Lake Ontario to Henderson Harbor, 180 miles to the east on the northeast corner of the lake. Ports like Wilson, Olcott, Point Breeze, Rochester, Sodus, Fairhaven, Mexico Point and Henderson Harbor all have their strong points, but today, in spring and early summer, I moor my charter boat in Oswego Harbor. Year after year the Oswego area consistently produces legendary trout and salmon fishing and the best spring brown trout fishing in Lake Ontario. The reasons are many, but the fact that the Oswego River , Lake Ontario’s second largest tributary, flows into the lake here, tops the list. This river’s drainage basin is 5,144 sq. miles, encompassing some of the richest agricultural land in central New York. Spring river flow, usually peaking near 20,000 cfs., with its sun warmed, nutrient rich, plankton laden plume is a major attraction for baitfish, trout and salmon. . In addition, the Oswego River supports one of Lake Ontario’s largest spawning runs of adult brown trout which drop downstream into the forage rich harbor to feed in the spring. This plentiful food supplies produces some of the biggest trophy browns in Lake Ontario. Fishing time is limited on charter fishing trips, and travel time to fishing areas is a major consideration. This is the second reason Oswego shines for spring browns. In and around Oswego Harbor, minutes from marinas and public docks, hordes of baitfish like alewives, smelt, gizzard shad, minnows, and gobies attract browns and other salmonids. Some mornings, my crews have their first line in the water in less than 5 minutes from the dock. On many trips, limit after limit of browns are caught in and just outside the harbor, or in the river plume no further than a mile or so from the harbor. In contrast, when I fished out of the Little Salmon River in the spring I commonly ran from 45 minutes to an hour to get to good brown trout fishing, Not so in Oswego, Less travel time to fishing areas means more fun fishing on each trip. Any experienced Lake Ontario angler can tell you it’s one thing to locate spring browns, but another to catch them in the gin clear shallows of the main lake, especially in bright sun. Browns are much easier to catch in colored water . This is another reason why the port of Oswego excels for spring brown trout fishing. Because of it’s huge watershed. When the spring snow melt is over and smaller streams and rivers are running crystal clear, the Oswego River is still high and turbid. The colored plume of the river sometimes extends for several miles east of the harbor along the shoreline, ideal for catching browns from dawn to dusk. When fishing is slow everywhere else in Lake Ontario because of clear water conditions, it can be red hot in the colored plume of the Oswego River. On any lake finding and catching fish is only part of the equation. Weather, especially wind, rears it’s ugly head at times, creating rough Lake Ontario seas which may keep charter boats ashore. Fortunately, for anglers fishing out of Oswego, the rock riprap breakwalls of Oswego Harbor, including the 2000 foot west wall, provide the protection charters need to get on the water when fishing isn’t possible anywhere else along the New York coastline. On many days when the main lake is a little to rough to fish anywhere else, it’s still possible to troll for spring browns inside Oswego Harbor or in the lee of the east breakwall. Brown trout aren’t the only game in town in early spring for Oswego charters. Each spring coho salmon, rainbows, steelhead, trophy walleyes, and occasional Atlantic salmon add to the excitement. Some years, like 2012, and, 2014, fishing is also excellent for shallow water king salmon and lake trout just outside the harbor. No Lake Ontario port can match this angling diversity in such close proximity to the harbor. 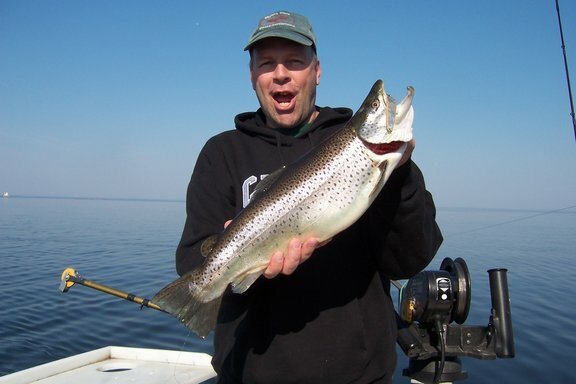 Add to this great nearby lodging, restaurants and diners only minutes away, and it is tough find a better place to book a charter for early season Lake Ontario brown trout. These three kings were taken fishing a single downrigger. New York State now allows anglers to fish three lines per person in Lake Ontario. You might think this would give folks who troll this 200 mile long trout and salmon “ocean” an advantage. In certain situations, more lines in the water on my charter boat does mean more fish in the boat. But, other times, it doesn’t. A spider web of lines in the water, doesn’t always produce more fish. Reasons why, include tangles from fishing too many lines, and wasted time rigging multiple lines instead of paying attention to location and proper trolling speed and direction. The most important reasons, though…, “noise” and disturbance from too many lines in the water, especially when fishing downriggers, just plain turns fish off. In July, 2013, during an on-water fishing class aboard my charter boat, I decided to show Todd Rogers and his crew that sometimes less is more when trolling for king salmon and steelhead. Todd and his friends who fished that day are verteran Lake Ontario trollers who fish the lake regularly in their own, well equipped boat. Each season, they book a charter trip with me to “bone up” on the latest trolling techniques. In the past, we had focused on everything from fine tuning flasher /bait presentations to fishing copper line from planer boards. This trip, I would show them something different. In 175 feet of water two miles west of Oswego Harbor where kings had been gorging on alewives every day for the past week, I slowed my charter boat to a trolling speed of 2.7 mph. On my 12-inch Garmin, we could see alewife schools and tell tale marks of king salmon around them. As I walked to the stern of the boat, I quickly rigged a flasher/fly on one corner rigger and a spoon on the other corner rigger, dropping them to the proper depth. Todd, eyeballing the other two rigger rods in the rod rack, each rigged with the same lures we had just set, was surprised when I told him we were only going to fish two riggers. The rods in the rack were there to be used for backup. Backup? He was even more surprised when I told him we weren’t going to fish the normal spread of 4 riggers, four wire Dipsys, and up to 6 copper lines. Instead, we would start with fewer lines, just two riggers, two wire Dipsy rods, and one copper line. Six hours later, with a limit of 11 kings and 1 steelhead in the cooler, Todd understood why. Sometimes, less is more. The simple strategy…, 1) Fish just a few effective lines. 2) Minimize rigging time, focusing on location, speed, and presentation of the lure spread. 3) Use backup rods. When a salmon hits a line, for instance a downrigger, as soon as the fish is hooked, immediately reset the rigger with the same lure while the fish is being fought. Ditto for wire Dipsy rods. That day, the flasher/fly 25 feet back on the starboard rigger wasn’t catching fish, but it was attracting kings to the spoon on the port rigger, trailing along 10’ behind and 5’ below the attractor. Three times we had two kings on at once, all caught on Blue Dolphin spoons fished from the port rigger. As soon as the spoon fired, my crew reset the port rigger with another rod rigged with the same spoon, while the fish was being fought. If they hadn’t, our hot rigger would have been out of commission for the 15-30 minutes it took to battle those 20-30 lb. kings to the net, unhook them and get the spoon back in the water…, more time in the water, more fish in the box! The combination of “backup rods” and less lines in the water was the right recipe for a great catch of king salmon. It had been a slow, slow brown trout bite all morning on LakeOntario under bright skies and a steady east wind on. Right on cue, as early May water temperature warmed in the OswegoRiver, hordes of prespawn alelwives had just begun to concentrate in OswegoHarbor. My veteran crew of Fish Doctor anglers and I knew the big, football browns were there. 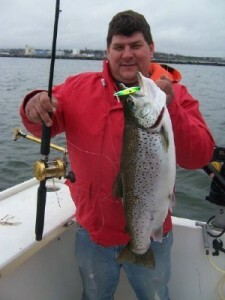 OswegoHarbor was stacked with brown trout, but lockjaw prevailed. We had worked thru my favorite selection of stickbaits and spoons, but the browns weren’t impressed. It was time to rev things up a bit. It was time to dig out one of my faroite attractors for sluggish trout and salmon, ultralight cowbells. Stinger forty inches behind it, the #2 downrigger fired 15’ down, and a bulging 8 lb. brown came thrashing to the surface spitting out freshly eaten 6” alewives. The extra flash and attraction of the cowbell was just what the doctor ordered for revving up the overstuffed brown. Fished with bait or artificials, cowbells have been used for trout and salmon, especially lake trout and rainbow trout, for many years. With two to seven 1”- 4” long spinner blades of various shapes(Colorado, willow leaf, etc.) behind a rudder that prevents line spin, they are rigged with a trailing leader of varied lengths and normally baited with minnows, smelt, alewives or worms, but are also fished with plugs like Flatfish, stickbaits like Rapalas, or spoons like Mooselooks, Suttons, and Alpena Diamonds. Leader length varies from 12” to 48” depending on the species fished and the size of the cowbell. A favorite of lake trout fishermen, they are often fished just off bottom using a 3-way swivel with a drop leader and just enough lead weight to keep them near bottom. Trolled slowly with a sewed alewife or Flatfish, cowbells with 3” to 4” blades are deadly for lakers in waters like LakeOntario and New York’s FingerLakes. Fished suspended on a weighted flatline or leadcore line, smaller cowbells baited with crawlers are a favorite of rainbow trout fishermen. Althought most anglers don’t realize it, cowbell are also very effective for brown trout, especially big browns, that are either in the doldrums because of cold fronts or east winds, or overstuffed with baitfish. In LakeOntario, when millions of alewives move inshore in May and June to spawn, cowbells fished with alewives or artificials on downriggers, or leadcore line are my go-to rigs for big browns. One of the reasons many anglers don’t use cowbells is that original cowbells with heavy blades made from nickel or chrome plated brass create a lot of resistance or drag in the water. The 48” long Les Davis with It’s four huge Colorado blades plus three 3 ½” willow leaf blades is like pulling a Volkswagon tire thru the water. It’s deadly for lakers, but unless you catch a fish over 5 lbs. on it, you hardly know it’s there. < www.hammerheadchartersandtackle.com>. Their larger 4/0 cowbell is excellent for lake trout, but I prefer the 3/0 cowbell for browns. Ultralight cowbells are also easy to make yourself using aluminum flashing, 90 lb. test stainless cable, and clevises and swivels available thru tackle craft catalogs. 91-year old Andy Morford, with a nice brown he boated on a copper rig. As a charter captain with 40 years of experience, I’ve always been a proponent of, “Take a kid fishing!” Kids are the future of our fishing and any of us who love the sport should do whatever we can to encourage kids to participate. On my charter boat, there is no charge for any kids that families or charter groups bring with them. But, what about the old-timers, the people who got us here, the folks who took the time out of their lives to share a special experience with us when we were youngsters and taught us how to fish? Old timers likeBob Lorenzen, Andy Morford, and Adrian Edmonds, all in their 80s and 90s are some of my favorites to fish with. Not long ago, I watched old-timer, Bob Lorenzen slowly make his way, with the help of a cane, down the dock toward my charter boat. This was the 25th year Bob, now 81 years old, had fished with me. I welcomed him in the early morning darkness. Never, ever late for the 5:00 AM dock departure, Bob was raring to go. As he stepped aboard, the only help he needed was someone to hold his cane …, independent old cuss. . I glanced behind Bob, and there was his grandson Dave, not too obvious, but close at hand, just in case. When Dave was in his early teens, Bob brought him along on a charter fishing trip with me aboard the “Fish Doctor”. On that trip, Dave landed his first king salmon, knees shaking, full of excitement. It was a fishing trip Dave never forgot, and later in his life, a favor he would never forget to repay. Da ve’s wife Jodi, and Bob’s fishing buddy, Fred rounded out the group. Fred, a spry 77 years, is pretty much just a youngster in Bob’s eyes. It was early September, and the king salmon were bunched up right at the mouth of Oswego Harbor. As usual, just off the Oswego lighthouse, when dawn broke over Lake Ontario’s east shore salmon action was wild, with almost every boat in the area hooked up. This was what Bob lived for, and always the last in the group to take his turn on a rod, he waited patiently for the fourth salmon, his fish, to hit. There is a reason we call Bob “Hawk”, he never misses seeing a hit before anyone else, never taking his eyes off the rod tips. Sure enough, even though I wondered if Bob could safely navigate the slippery cockpit deck to get to the rod, when the next king hit, he was there, his cane forgotten. With experience from many years on the water, and muscles not as young as they used to be, Bob fought the unseen king salmon in a give and take battle. Minutes passed and we still hadn’t seen the big king. I started wondering if we might have accidentally foul hooked the fish. Finally the monster surfaced in the wash of the inboard, and I could see the trebles of the glow green #5 J-plug buried deep in it’s mouth. A quick swipe of my oversized landing net and the fish was Bob’s, a big hen, 36 lb. on my Sampson digital scale. It was Bob’s biggest ever LakeOntario king salmon, and a real thrill. As my eyes met Dave’s, I could see the whole story…, a little payback for an old-timer who took the time to bring him along fishing years ago. Where are these ol’ timers like Bob Lorenzen now? In their later years they are often unable to handle their own boat, or maybe even unable to drive to a fishing spot? Take a look around my friends. It’s great to think about taking a kid fishing, but just don’t forget the old- timers. Ed DeGraff fished landlocked salmon exclusively on 28,000 acre Lake George in northeastern New York. Ed passed some time ago, but in his day, no one caught more salmon in this pristine Adirondack Lake in late spring and summer than he did. I met Ed in 1974 when I was working as a fishery biologist to restore the landlocked salmon fishery in Lake George. Twenty-four years prior in, 1958, the lake had produced a 16 lb. 8 oz. New York State record. Soon after, though, landlocks all but disappeared from the lake. Thanks to dozens of volunteers scatter planting tens of thousands of landlocked salmon fry throughout Lake George tributaries, the salmon fishery made a comeback by the early 70s. Ed was one of the Lake George anglers enjoying the fruits of the restoration program. He had volunteered to participate in a voluntary angler diary program, one of the tools I used to evaluate the progress of the management program. Personally reviewing the data from all of the angler diary cooperators, I couldn’t help notice that in late spring and summer Ed was reporting almost entirely landlocked salmon and was catching far more and larger salmon than any other Lake George angler, including several fishing guides. Surprisingly, while most other anglers were trolling with leadcore and wire lines, Ed fished alone, exclusively with downriggers, a rarity on most trout and salmon waters at the time. An avid angler myself and a regular on Lake George, curiosity got the best of me. When I telephoned Ed, and asked how he was catching so many salmon in midsummer, he offered to show me if I kept it to myself until he no longer could fish the lake. Ed knew Lake George like the back of his hand after fishing it for many years and targeted locations where he had caught midsummer salmon year after year. Although he didn’t use a thermistor to find cold water temperatures, I guessed the temperature at the depths he was fishing in late May thru August was 54 degrees or colder. He was also trolling no slower than what I figured was 3.0 mph, or so. His setup using two downriggers and two light action rods fitted with level wind reels and 10 lb. test line was simple. First, he attached a chrome #00 Luhr Jensen dodger to the ring on the rudder of each of his unpainted 8 lb. downrigger weights, using the corkscrew clip on the tail of the dodger. This dodger was rigged to spin behind the weight at trolling speeds. To the trailing end of the dodger, he attached a 3/8 oz. bead chain keel sinker to slow the spin of the dodger. Next, he clipped a 10”section of downrigger cable between the weight and his downrigger release to prevent the spinning attractor from tangling in his line. He trolled spoons with a setback of 15 to 25 feet behind the weight. Favorites were either a red and white spoon with either a nickel or copper back, or ¼ and 3/8 oz. Mooselook wobbers in copper, gold, fluorescent red, and orange/black dot. Ed gave a lot of the credit for his catches to presentation…, trolling erratically, changing direction, speeding up, slowing down, but seldom trolling less than 3.0 mph. Ed lived to see the comeback of the Lake George salmon fishery in the late 70’s when huge landlocks up to 14 – 16 lbs. were not uncommon. He didn’t boat the 19 lb. 3 oz. Lake George record taken in 1981, but I know he appreciated it. He never fished Lake Ontario, but his technique would be deadly there, as well.